This is a blog post by iOS Tutorial Team member Gustavo Ambrozio, a software engineer with over 20 years experience, including over three years of iOS experience. He is the founder of CodeCrop Software. You can also find him on Google+. 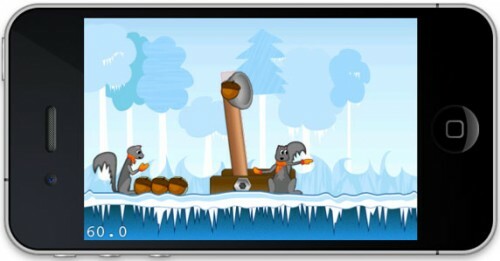 In this tutorial series we’ll build a cool catapult type game from scratch using Cocos2D and Box2D! 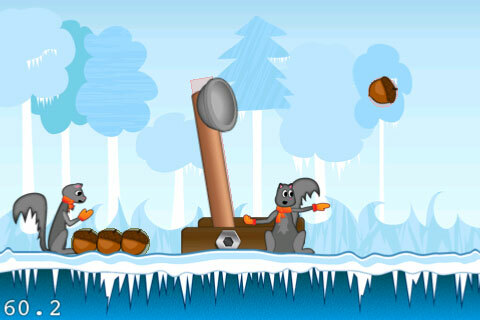 We’ll use the art created by Ray’s lovely and talented wife Vicki to create a game about catapults, acorns, dogs, cats, and angry squirrels. 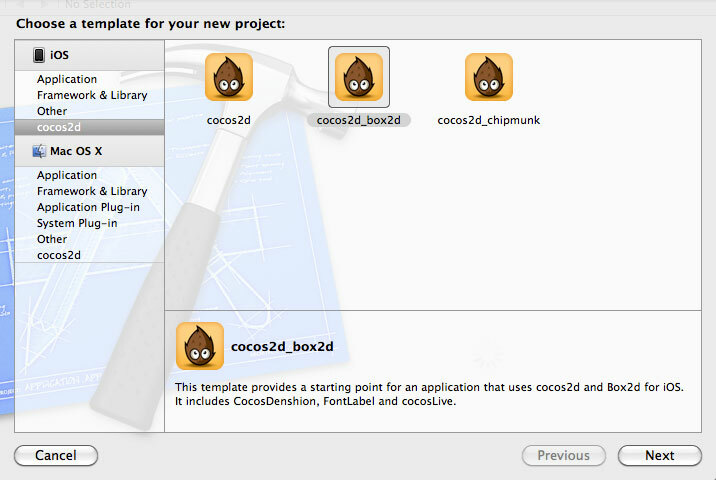 This tutorial series assumes that you’ve already gone through the Intro to Box2D with Cocos2D Tutorial: Bouncing Balls Tutorial or have equivalent knowledge. It also uses a bunch of concepts found on the How To Create A Breakout Game with Box2D and Cocos2D Tutorial (part 1 and part 2). Fire up Xcode and click “Create a new Xcode project”. 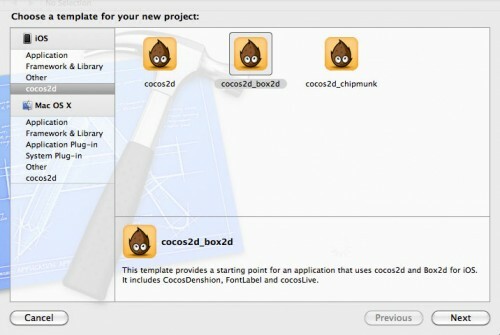 Under iOS, choose cocos2d and choose the cocos2d_box2d template and click Next. On the next step select the folder where you want to store your project. 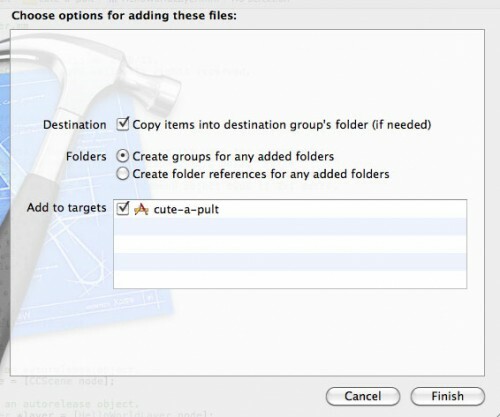 You don’t have to create a new folder, Xcode will create one for you. I’d suggest enabling source control but this is not necessary. When you click create your project will be created and we’ll be ready to start coding! Cool, so it runs and you can play with a few blocks. Cool, but not nearly as cool as what we’re about to make! 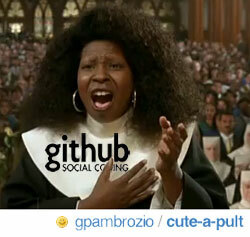 There isn't an ocean too deep that will keep me away from GitHub! 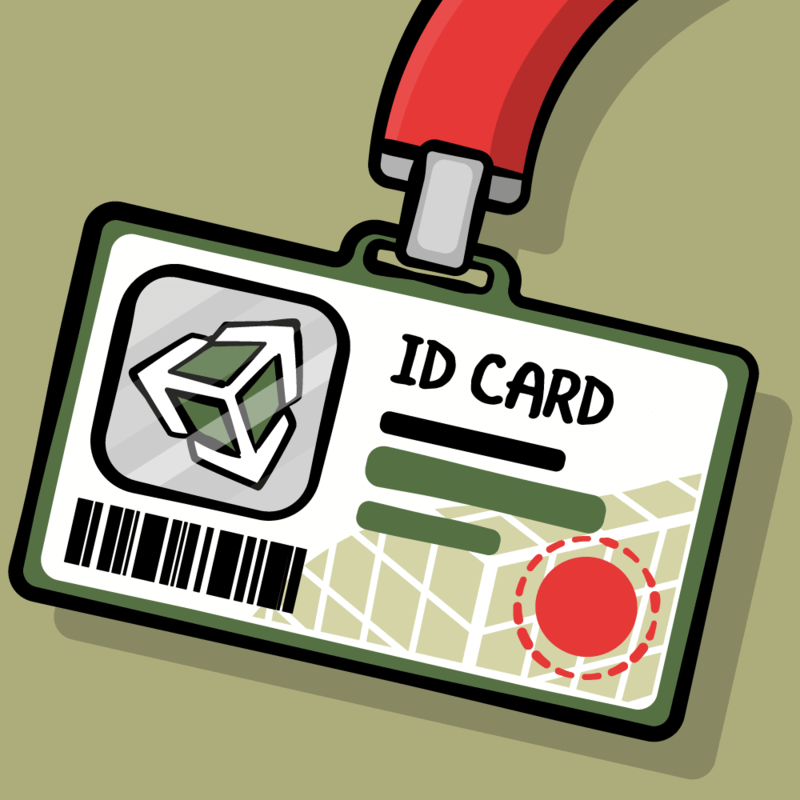 If you want to follow me wherever I may go, check out this project’s GitHub page! Yes that’s right, for the first time in tutorial history (maybe I’m exaggerating a bit, I haven’t checked this in any way…) I’ll publish the entire tutorial files, with comments and tags for every steps on GitHub! The repository tag for this point in the tutorial is ProjectTemplate. You can download the project zip at this state here. Before we get out hands dirty, let’s do some cleanup. Open HelloWorldLayer.h and remove the declaration for addNewSpriteWithCoords:(CGPoint)p.
Now you’ll have a warning on this file on the init method because of a call to addNewSpriteWithCoords:(CGPoint)p. Let’s cleanup the init method. That’s it for the HelloWorld.mm file. Let’s just remove the blocks png file so we don’t have any files that are not really necessary. Open the resources group on the project navigator and remove the blocks.png file. When ask if you want to remove the reference only or delete don’t be shy and hit Delete as we really don’t want this file anymore. The repository tag for this point in the tutorial is CleanUpProject. First let’s add the images we’ll use on the project. Again, I got these images from Vicki’s site but I had to modify them a bit for the purpose of the game. Basically I changed the catapult arm to already include the cup and straightened it to make the physics easier. So go ahead and download my modified files from GitHub. Now expand this archive. This will create a new folder called “images”. Drag this folder to the Resources group of your project. Be sure to check the “Copy items into destination group’s folder” to copy these files to your project folder. Right now we’re just adding sprites that will not be part of the physics simulation. We add the sprites that are on the back of the scene first and work our way to the front. The default anchor point of CCSprite is the middle of the sprite. I’m changing it to the left-bottom corner of the image to make it easier to place them. w00t, it’s starting to look good already! The repository tag for this point in the tutorial is BeforePhysics. It’s time to start adding some physics to this world. Right after the code you added above is the template’s code to create the world borders. Let’s change this a bit to describe our world. If you already went through the previous Box2d tutorials on the site (and if you haven’t I recommend going through those before continuing) most of this should be to you. 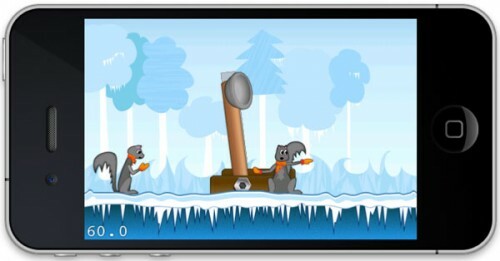 We first load the catapult’s arm sprite and add it to the scene. Notice the z index. We used z indexes when we added the static sprites to the scene, so this z index puts the arm between the two sides of the catapult to look nice. Notice also that we didn’t specify the sprite’s position. That’s because the tick method will set the sprite’s position to the Box2D body’s position. Next we create the Box2d body as a dynamic body. The userData here is important because of what I mentioned on the last paragraph, so that the sprite will follow the body. Also notice that the position is set to be above the FLOOR_HEIGHT we defined. That’s because here we have to use the position of the center of the body, we can’t use the left-bottom corner using Box2d. Next comes the creation of the fixture that describes the body’s physical features. It will be a simple rectangle. In this picture, the black rectangle is the size of the sprite, and the red rectangle is the size we want for the fixture. You can get these dimensions using any image editing software. Just remember to use the standard resolution image for this as the -hd version gets scaled to the standard size. So far so good – now let’s add some movement to this catapult! We need to somehow restrict the movement of the catapult so that it rotates around a point. The way you restrict motion of Box2D bodies relative to each other is via joints. No Jay and Silent Bob, not that kind of joint! There’s one particular joint that is perfect for this – a revolute joint. Think of this as pinning two bodies together at a particular point, but still allowing them to rotate. So we can “pin” the catapult arm to the ground at the base of the catapult to get the effect we want! 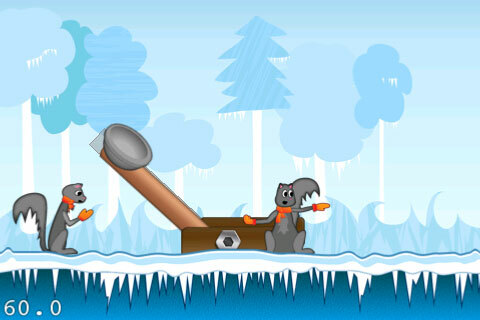 // Create a joint to fix the catapult to the floor. When creating the joint you have to specify 2 bodies and the hinge point. You might be thinking: “shouldn’t the catapult’s arm attach to the base?”. Well, in the real world, yes. But in Box2d not necessarily. You could do this but then you’d have to create another body for the base and add more complexity to the simulation. Since the base would be static anyway and the in Box2d the hinge body doesn’t have to be in any of the to bodies, we can just use the groundBody that we already have. The angle limits, combined with a motor make the catapult behave much like a catapult in the real world. You’ll also notice we set a motor up on the joint, by setting “enableMotor”, “motorSpeed”, and “maxMotorTorque”. By setting the motor speed to negative, this makes the catapult arm want to continually rotate clockwise (kind of like a spring on a catapult). However, we also enabled limits on the joint by setting “enableLimit”, “lowerAngle”, and “upperAngle”. This makes the arm stop rotating at the 9 degree angle (slightly bent to the left) and a 75 degree angle (pulled back a good bit to the left). This simulates the movement of the catapult arm we want. In a while we’ll add another joint that will let you pull back the catapult. When we release this force the motor will make the arm fling forward, much like a real catapult would! The motor speed value is in radians per second. Yes, not very intuitive, I know. What I did was to just try out different values until I had the desired effect. You can start out small and increase it until you get the desired speed for the arm. The maxMotorTorque parameter is the max torque the motor can apply. This value is also something that you can vary to see how things react. Again it will become clear soon. The repository tag for this point in the tutorial is CatapultJoint. Ok, now it’s time to move this arm. To accomplish this we’ll use a mouse joint. If you went through Ray’s breakout game tutorial you already know what a mouse joint does. the convention is to use the ground body. The second is the body you want to move”. The target is where we want the joint to pull our arm’s body. We have to convert the touch first to the Cocos2d coordinates and then to the Box2d world coordinates. We only create the joint if the touch is to the left of the arm’s body. 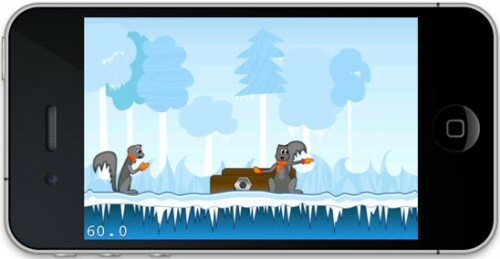 The 50 pixels offset is because we’ll allow the touch to be a little to the right of the arm. 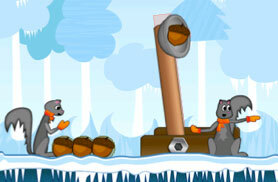 The maxForce parameter will determine the max force applied to the catapult’s arm to make it follow the target point. In our case we have to make it strong enough to counteract the torque applied by the motor of the revolute joint. If you make this value too small you won’t be able to pull the arm back because it’s applying a large torque to it. You can then decrease the maxMotorTorque specified in our revolute joint or increase the maxForce of the mouse joint. This method is simple enough. It just convert the point to world coordinates and then changes the target point of the mouse joint to this point. Simple enough. Just destroy the joint and clear the variable. Try it out now. Run the project and pull the arm back with your finger. When you let go you’ll see the arm go back very fast to it’s resting position. This is actually too fast. What controls this speed, as you remember, is the motorSpeed of the revolute joint and the maxMotorTorque applied. Let’s try to decrease the value of the motorSpeed and see what happens. Go to the init method and try a few smaller values for yourself to get a sense of it. A value that worked well for me was -10. Change it to this value and you’ll see the speed is something that seems more natural for a catapult. The repository tag for this point in the tutorial is MouseJoint. You know what time it is – heavy ammunition time, heh heh! Or acorns, in this case. Most of this method should be familiar to you by now. 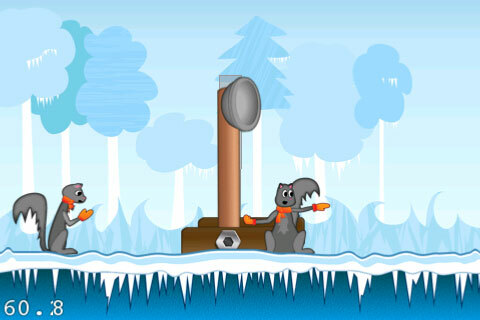 Our method will create a variable number of bullets, evenly spaced between the first squirrel and the catapult’s body. One detail you might not have seen before are the “bullet” parameter of the bulletBodyDef. This tells box2d that this will be a fast moving body so box2d will be extra careful with it during the simulation. By default, Box2D uses continuous collision detection (CCD) to prevent dynamic bodies from tunneling through static bodies. This is done by sweeping shapes from their old position to their new positions. The engine looks for new collisions during the sweep and computes the time of impact (TOI) for these collisions. Bodies are moved to their first TOI and then halted for the remainder of the time step. Normally CCD is not used between dynamic bodies. This is done to keep performance reasonable. In some game scenarios you need dynamic bodies to use CCD. For example, you may want to shoot a high speed bullet at a stack of dynamic bricks. Without CCD, the bullet might tunnel through the bricks. The bulletBody will keep track of the currently attached bullet body so we can track it’s movement later. The bulletJoint will keep a reference to the joint we’ll create between the bullet and the catapult’s arm. We first get the pointer to the current bullet (we’ll have a way to cycle through them later). The SetTransform method changes the position of the center of the body. The position in the code is the position of the tip of the catapult. We then set the bullet body to active so Box2d starts simulating it’s physics. We then create a weld joint. A weld joint attaches two bodies on the position we specify in the Initialize method and don’t allow any movement between them from that point forward. We set collideConnected to false because we don’t want to have collisions between the bullet and the catapult’s arm. Notice that we return YES if there were still bullets available and NO otherwise. This will be useful later to check if the level is over because we ran out of bullets. The corn is a little off the mark. That’s because the position I set for the corn to attach is the position for when the catapult’s arm is at 9 degrees, at the resting position. But at the end of the init method the catapult is still at the zero degree angle so the bullet actually gets attached to the wrong position. If we now pull the catapult’s arm and release the corn will not be released because it’s welded to the catapult. We need a way to release the bullet. To do this we just have to destroy the joint. But where and when to destroy the joint? The best way is to check for some conditions on the tick method that gets called on every simulation step. This will set our release variable to YES only if the arm gets released then the arm is at least at a 20 degree angle. If we just pull the arm a little bit we won’t release the bullet. // Arm is being released. Pretty simple, right? We wait until the arm is almost at it’s resting position and we release the bullet. Run the project and you should see the bullet flying off very fast! In my opinion a little too fast. Let’s try to slow it down a bit by decreasing the max torque of the revolute joint. Go back to the init method and decrease the max torque value from 4800 to 700. You can try out some other values to see what the effect is. Try again and ah much better – acorn flying action! One thing that would be nice is if we could make the scene move to follow the bullet so we can see it’s whole movement. The condition checks is there’s a bullet that was attached but is not anymore, so it must be moving. We then get it’s position and check if it’s after the right of the screen’s middle. If it is we change the position of the screen to make the bullet be in the middle of the screen. Notice the minus sign in front of the MIN. We do this because the position has to be negative to make the scene move to the left. Try it out. It’s pretty cool now! 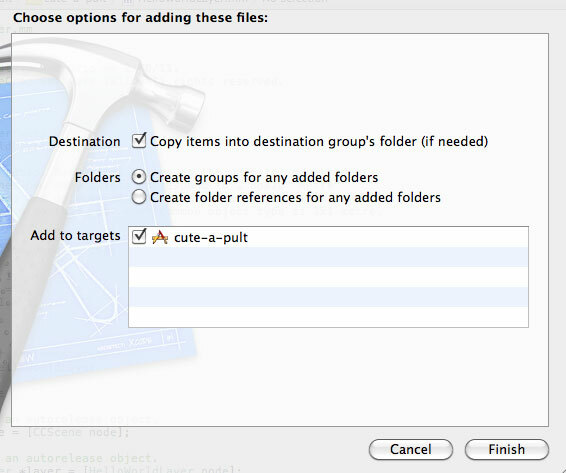 The repository tag for this point in the tutorial is BulletCreation. At this point, you should have a great start of a catapult game – the catapult works quite well! Head over to the next part of the tutorial, where we expand this into a full game with enemies and collision detection! 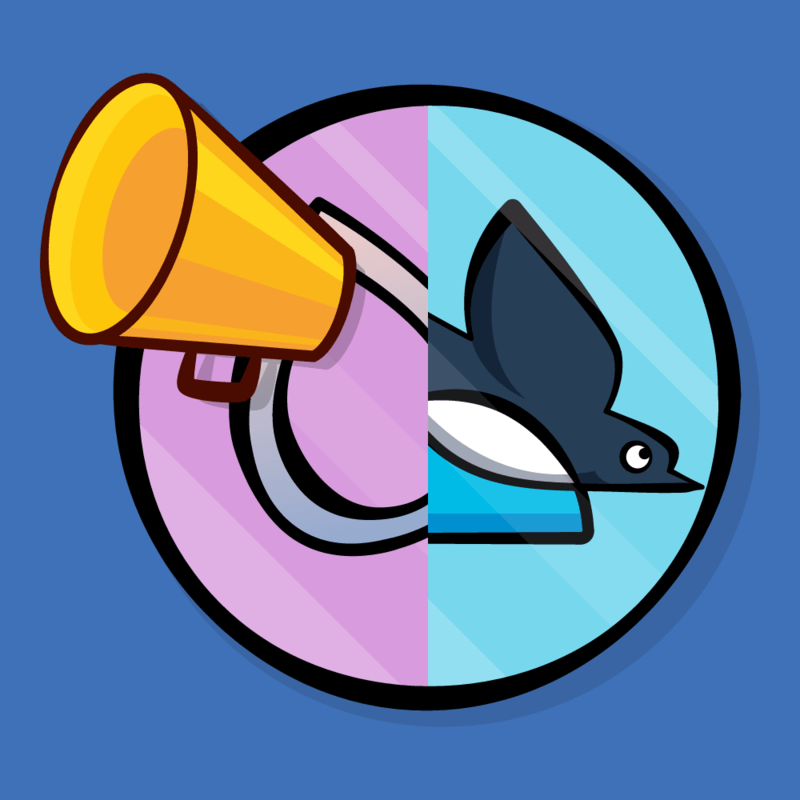 In the meantime, if you have any questions or comments, join the forum discussion below!